Surface diffusion, or migration within the electrical double layer next to mineral surfaces, is often invoked as a significant contributor to the overall diffusion coefficient in compacted clays, particularly where model predictions underestimate measured diffusion coefficients. 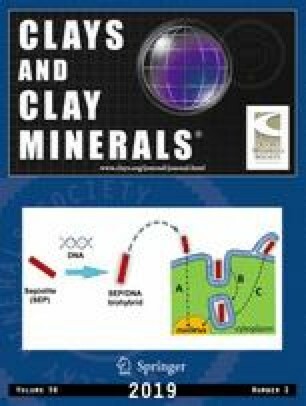 The potential for surface diffusion of Sr2+, Ca2+ and Na+ on three clays compacted to dry bulk densities of 1.25 and 1.60 Mg/m3 was examined. The clays were a bentonite, an illite/smectite, and a glacial lake clay (composed mainly of smectite, illite, kaolinite and quartz). The clays were saturated with a Na-Ca-Cl-dominated synthetic groundwater solution with an effective ionic strength of 220 mol/m3. Total intrinsic diffusion coefficients for the cations were determined from their steady-state flux through compacted clays, and apparent diffusion coefficients were obtained from the time-lag technique. Models of diffusive transport in compacted clays, based only on diffusion in the pore solution, adequately described the diffusion data for all clays and diffusants, and there was no need to invoke other transport mechanisms, like surface diffusion. The data indicate that surface diffusion is not a significant transport mechanism in compacted clays at least to a clay density of 1.60 Mg/m3.